Jak Katarikawe (1938-2018) was, until October 19th, a living legend who inspired younger artists for both his talent and apparent financial success. He was among the first East Africans whose artworks could sell for hundreds of thousands of shillings a painting. 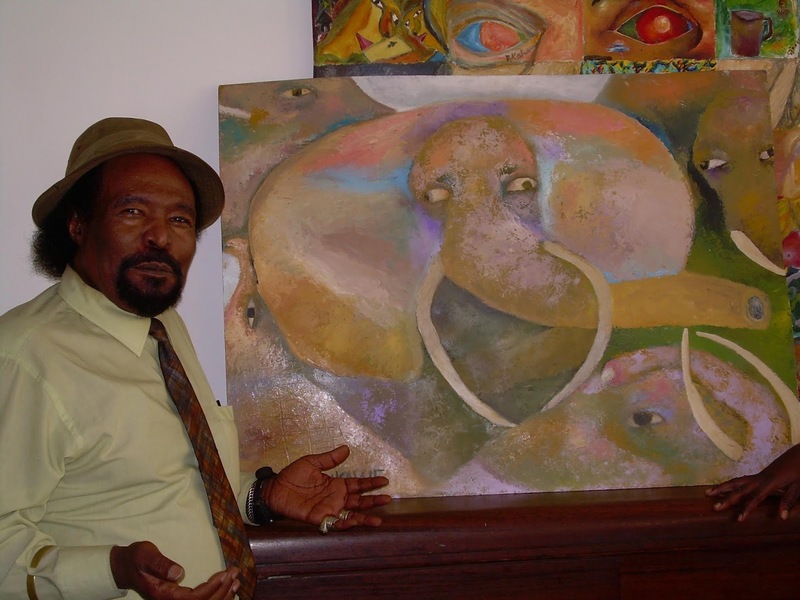 He is also one of the first East Africans whose artworks were exhibited abroad, in Europe and the USA. Jak’s legendary status was confirmed the same day he died, when news spread like wildfire on social media that Jak had passed on. He’d been found alone and unconscious by a cousin who’d come to his Forest Road flat to cook for him as Jak’s wife Florence was back in Uganda. Friends had tried to get him to accompany her home as he’d built a house for the family in Kabale, in Western Uganda. Yet he refused. In his prime, Jak was known as an ‘African [Marc] Chagall’, named after the 20th century modern artist who, like Jak, created colorful, whimsical paintings that invariably had an enchanting narrative to back up his imagery. In Jak’s case, they were stories that were often about love triangles that he used to explain with a merry twinkle in his eye. Jak never had a chance to go to school since his polygamous father had retired by the time he was born and he was the last born of the old man’s youngest wife. But Jak had natural talent. Plus his mother was artistic. Jak once recalled how she used to paint lovely designs in ash all around her mud and wattle hut as a means of attracting the old man to come for supper at her home. Jak also recalled how he was inspired by the stained glass windows of the nearby church. He said they’d taught him the value of translucent colors and the storytelling power of art. Jak’s big break came when he became a driver for a Makerere University professor who found his sketches stashed in the boot of his car. Professor David Cook could see that Jak had talent. Cook then arranged for him to be mentored by Professor Sam Ntiru, who at the time was head of Makerere’s Art Department. After spending some time at Makerere, Jak came to Kenya in the early 1970s and initially he worked with Elimo Njau at Paa ya Paa. Subsequently he exhibited at Alliance Francaise and at Gallery Watatu. Jak was already established when the late Ruth Schaffner bought Gallery Watatu in 1985 from Yony Waite, co-founder of Watatu. She quickly took Jak under her wing and soon became his mentor, mother-figure, accountant and bank. She took his art worldwide, but after she died in 1996, Jak never recovered. He went into mourning and never got over his grief. Ruth’s death also had a profound effect on his painting. Jak could never reactivate his effortless style of visual storytelling. Despite being pestered for years by art collectors from all over the world who frequently came personally to buy his art, he could never regain his creative edge. He soon exhausted his supply of the paintings that expressed the ‘old Jak’. Nonetheless, any time one of his older paintings has gone up for auction, the prices have shot sky high. Many people believe Jak’s art will only accrue in value over time, as it did for other artists who died poor, such as Vincent Van Gogh, but now their paintings sell for millions. Jak will primarily be remembered for the luminous artworks he created between the mid-70s and mid-90s. But to his friends, he’ll be remembered as the sweet-spirited gentleman whose skill in visual storytelling was sublime. Jak was buried quietly at his Kabale home on October 28th, just a week after he passed. Tributes to him continue to pour in on social media. Plans are also underway to have a memorial service for Jak in the near future.